Each CYSTAGON® Capsule contains 50 mg or 150 mg of cysteamine free base as cysteamine bitartrate. CYSTAGON® Capsules contain the following inactive ingredients: ammonium hydroxide, black iron oxide, colloidal silicon dioxide, croscarmellose sodium, gelatin, magnesium stearate, microcrystalline cellulose, pharmaceutical glaze, pregelatinized starch, propylene glycol, sodium lauryl sulfate and titanium dioxide. Cystinosis is an autosomal recessive inborn error of metabolism in which the transport of cystine out of lysosomes is abnormal; in the nephropathic form, accumulation of cystine and formation of crystals damage various organs, especially the kidney, leading to renal tubular Fanconi Syndrome and progressive glomerular failure, with end stage renal failure by the end of the first decade of life. In four studies of cystinosis patients before cysteamine was available, renal death (need for transplant or dialysis) occurred at median age of less than 10 years. Patients with cystinosis also experience growth failure, rickets, and photophobia due to cystine deposits in the cornea. With time most organs are damaged, including the retina, muscles and central nervous system. Cysteamine is an aminothiol that participates within lysosomes in a thiol-disulfide interchange reaction converting cystine into cysteine and cysteine-cysteamine mixed disulfide, both of which can exit the lysosome in patients with cystinosis. Normal individuals and persons heterozygous for cystinosis have white cell cystine levels of < 0.2 and usually below 1 nmol/½ cystine/mg protein, respectively. Individuals with nephropathic cystinosis have elevations of white cell cystine above 2 nmol/½ cystine/mg protein. White cell cystine is monitored in these patients to determine adequacy of dosing, levels being measured 5 to 6 hours after dosing. In the Long-Term Study (see Clinical Trials, below) entry white cell cystine levels were 3.73 nmol/½ cystine/mg protein (range 0.13 to 19.80 nmol/½ cystine/mg protein) and were maintained close to 1 nmol/½ cystine/mg protein with a cysteamine dose range of 1.3 to 1.95 g/m2/day. After administration of cysteamine HCl, leukocyte cystine levels fall, with minimum levels at approximately 1 hour. Because cysteamine HCl has an unpleasant taste and odor, other formulations have been developed, including phosphocysteamine, the phosphorothioester of cysteamine that is rapidly converted to cysteamine in the gut, and cysteamine bitartrate (CYSTAGON®). 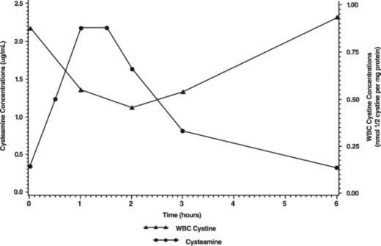 Cysteamine bitartrate has been shown in a transfer study in 8 patients to maintain white cell cystine levels below 1 nmol/½ cystine/mg protein when substituted for cysteamine HCl or phosphocysteamine. Total cysteamine levels 2 and 6 hours post-dosing were higher after cysteamine bitartrate than for the solutions. The pharmacokinetics and pharmacodynamics of CYSTAGON® were studied in eleven pediatric patients with nephropathic cystinosis who received 225 to 550 mg of cysteamine bitartrate every 6 hours daily for more than one year. Following repeated oral administration of 225 to 550 mg cysteamine bitartrate, the mean time to maximum plasma concentration (Tmax) occurred at about 1.4 hours post dose with mean steady-state peak plasma concentration (Cmax) and area under the concentration-time curve (AUC) of 2.6 µg/mL and 6.3 µg∙hr/mL, respectively. The apparent volume of distribution and apparent plasma clearance of cysteamine were 156 L and 1.2 L/min, respectively. Cysteamine was moderately bound to human plasma proteins, predominantly to albumin, with mean protein binding of about 52%. Plasma protein binding was independent of concentration over the concentration range achieved clinically with the recommended doses. The pharmacodynamic response increased with the plasma cysteamine concentration, with maximum response occurring approximately 1.8 hours post dose with an average reduction of white cell cystine concentration of about 0.46 nmol/½ cystine/mg protein and returning to baseline level 6 hours post dose. Most clinical data have been developed using cysteamine HCl or phosphocysteamine solutions. In all discussions that follow, administered amounts of various cysteamine salts will be expressed as amounts of cysteamine free base. There are approximately 200 pre-transplant cystinosis patients in the United States with nephropathic cystinosis and clinical studies have included almost all of them, in addition to about 40 studied in the United Kingdom. For all patients, mean age at entry into studies was just under 4 years. Patients were approximately equally divided between genders and about 85% were white, 9% were black, and 3% were hispanic. The National Collaborative Cysteamine Study (NCCS) treated 94 children (mainly from the United States) with nephropathic cystinosis with increasing doses of cysteamine HCl (mean dose 54 mg/kg/day) to attain white cell cystine levels of less than 2 nmol/½ cystine/mg protein 5 to 6 hours post-dose, and compared their outcome with an historical control group of 17 children who had been in the placebo group of a randomized placebo-controlled trial of ascorbic acid. Cysteamine treated patients had been diagnosed at a mean age of 22 months and were a mean age of 46 months old at study entry; placebo patients had been diagnosed at about 29 months and were a mean age of about 52 months old at study entry. The principal measures of effectiveness were serum creatinine and calculated creatinine clearance and growth (height). The average median white cell cystine level attained during treatment in the NCCS was 1.7 ± 0.2 nmol/½ cystine/mg protein. There were 70 cysteamine patients with baseline serum creatinine less than 2 mg/dL who were followed for at least a year and 17 placebo patients. Twelve of the 94 cysteamine treated patients required early dialysis or renal transplant. Median follow-up of cysteamine patients was over 32 months and 20% were followed more than 5 years. For the placebo group median follow-up was 20 months and only one was followed more than 24 months. Among cysteamine patients glomerular function was maintained over time despite the longer period of treatment and follow-up. Placebo treated patients, in contrast, experienced a gradual rise in serum creatinine. Height, corrected for age, was compared for treated patients with the height, at the various ages patients appeared, of the 143 patients initially screened for inclusion in the NCCS. Patients on treatment maintained growth (did not show increasing growth failure compared to normals) although growth velocity did not increase enough to allow patients to catch up to age norms. Renal tubular function was not affected by treatment. Calculated creatinine clearances were evaluated for two groups of children, one with poor white cell cystine depletion and one with good white cell cystine depletion as shown in Table I. The final mean creatinine clearance of the good depletion group was 20.8 ml/min/1.73 m2 greater than the mean for the poor depletion group, despite the older mean age of the good depletion group. Median leukocyte cystine levels were over 3 nmol/½ cystine/mg protein or were not measured at least 2 times per year. Patients did receive cysteamine for at least 1 year. Median leukocyte cystine levels were less than 1 nmol/½ cystine/mg protein and received cysteamine for at least 1 year. The Long Term Study, initiated in 1988, utilized both cysteamine HCl and phosphocysteamine (patient’s choice) in 46 patients who had completed the NCCS (averaging 6.5 years of treatment) and 93 new patients. Patients had cystinosis diagnosed by elevated white cell cystine (mean 3.63 nmol/½ cystine/mg). New patients and 46 continuing patients were required to have serum creatinine less than 3.0 mg/dL and 4.0 mg/dL, respectively. Patients were randomized to doses of 1.3 or 1.95 g/m2/day and stratified according to whether the serum creatinine was above 1.2 mg/dL or not. Doses could be raised if white cell cystine levels were approximately 2 nmol/½ cystine/mg protein and lowered due to intolerance. Mean doses were 1.27 g/m2/day and 1.87 g/m2/day in the two groups and white cell cystine levels averaged 1.72 ± 1.65 nmol/½ cystine/mg protein and 1.86 ± 0.92 nmol/½ cystine/mg protein in the 1.3 and 1.95 g/m2/day groups, respectively. In new patients, a group similar in age to the NCCS group, serum creatinine was essentially unchanged over the period of follow-up (about half of the patients were followed for 24 months) and phosphocysteamine and cysteamine HCl had similar effects. The long-term follow-up group, about nine years old on average at entry, stayed in the study (almost 80% were followed at least 2 years) and had essentially no change in renal function. In four studies of untreated cystinosis, renal death (need for transplant or dialysis) occurred at median age of less than 10 years. Both groups maintained height (although they did not catch up from baseline). There was no apparent difference between the two doses. CYSTAGON® is indicated for the management of nephropathic cystinosis in children and adults. CYSTAGON® is contraindicated in patients who have developed hypersensitivity to it or to cysteamine or penicillamine. If a skin rash develops, CYSTAGON® should be withheld until the rash clears. CYSTAGON® may be restarted at a lower dose under close supervision, then slowly titrated to the therapeutic dose. If a severe skin rash develops such as erythema multiforme bullosa or toxic epidermal necrolysis, CYSTAGON® should not be readministered. CNS symptoms such as seizures, lethargy, somnolence, depression, and encephalopathy have been associated with cysteamine. If CNS symptoms develop, the patient should be carefully evaluated and the dose adjusted as necessary. Neurological complications have been described in some cystinotic patients not on cysteamine treatment. This may be a manifestation of the primary disorder. Patients should not engage in hazardous activities until the effects of CYSTAGON® on mental performance are known. Gastrointestinal ulceration and bleeding have been reported in patients receiving cysteamine bitartrate. Physicians should remain alert for signs of ulceration and bleeding and should inform patients and/or guardians about the signs and symptoms of serious G.I. toxicity and what steps to take if they occur. Post-marketing reports include one report of interstitial nephritis with early renal failure. A causal relationship between this event and cysteamine bitartrate therapy has not been established. Gastrointestinal tract symptoms including nausea, vomiting, anorexia and abdominal pain have been associated with cysteamine, sometimes severe. In addition, gastrointestinal ulceration and bleeding have been reported in patients on cysteamine therapy. If these develop, therapy may have to be interrupted and the dose adjusted. A cysteamine dose of 1.95 grams/m2/day (approximately 80 to 90 mg/kg/day) was associated with an increased number of withdrawals from treatment due to intolerance and an increased incidence of adverse events. Cysteamine has occasionally been associated with reversible leukopenia and abnormal liver function studies. Therefore, blood counts and liver function studies should be monitored. There have been reports of benign intracranial hypertension (or pseudotumor cerebri; PTC) and/or papilledema associated with CYSTAGON® treatment that has resolved with the addition of diuretic therapy. PTC may be more common in cystinotic patients because of concurrent medication and renal transplantation. Although a causal relationship of PTC to CYSTAGON® has not been established, physicians should monitor patients receiving CYSTAGON® for this condition. Physicians should instruct patients to report any of the following symptoms: headache, tinnitus, dizziness, nausea, diplopia, blurry vision, loss of vision, pain behind the eye or pain with eye movement. A periodic eye examination is needed to identify this condition early and timely treatment should be provided when it occurs to prevent vision loss. There have been reports of serious skin lesions in patients treated with high doses of CYSTAGON® or other cysteamine salts that have responded to cysteamine dose reduction. These skin lesions are purplish hemorrhagic lesions over the elbow area on both arms and have been described as molluscoid pseudotumors. Skin striae, bone lesions (that have been described as osteopenia, compression fractures, scoliosis and genu valgum) along with leg pain and joint hyperextension may also be present. One patient with serious skin lesions subsequently died of acute cerebral ischemia with marked vasculopathy. Physicians should routinely monitor the skin and bones of patients receiving CYSTAGON®. If similar skin or bone abnormalities appear, the dose of CYSTAGON® should be reduced. See attached information for patients and parents and/or guardians. Leukocyte cystine measurements are useful to determine adequate dosage and compliance. When measured 5 to 6 hours after CYSTAGON® administration, the goal should be a level < 1 nmol/½ cystine/mg protein. In some patients with poorer tolerability for CYSTAGON®, patients may still receive benefit with a white cell cystine level of less than 2 nmol/½ cystine/mg protein. Measurements should be done every three months, more frequently when patients are transferred from cysteamine hydrochloride or phosphocysteamine solutions to CYSTAGON®. Physicians should follow patients for signs and symptoms of gastrointestinal ulceration and bleeding, and should inform patients and/or guardians of the importance of this follow-up. None have been described. CYSTAGON® can be administered with electrolyte and mineral replacements necessary for management of the Fanconi Syndrome as well as vitamin D and thyroid hormone. Cysteamine has not been tested for its carcinogenic potential in long-term animal studies. Cysteamine was not mutagenic in the Ames test. It produced a negative response in an in-vitro sister chromatid exchange assay in human lymphocytes, but a positive response in a similar assay in hamster ovarian cells. Repeat breeding reproduction studies were conducted in male and female rats. Cysteamine was found to have no effect on fertility and reproductive performance at an oral dose of 75 mg/kg/day (450 mg/m2/day, 0.4 times the recommended human dose based on body surface area). At an oral dose of 375 mg/kg/day (2,250 mg/m2/day, 1.7 times the recommended human dose based on body surface area), it reduced the fertility of the adult rats and the survival of their offspring. Teratology studies have been performed in rats at oral doses in a range of 37.5 to 150 mg/kg/day (about 0.2 to 0.7 times the recommended human maintenance dose on a body surface basis) and have revealed cysteamine bitartrate to be teratogenic and fetotoxic. Observed teratogenic findings were cleft palate, Kyphosis, heart ventricular septal defects, microcephaly and exencephaly. There are no adequate and well-controlled studies in pregnant women. CYSTAGON® should be used during pregnancy only if the potential benefit justifies the potential risk to the fetus. It is not known whether cysteamine is excreted in human milk. Because many drugs are excreted in human milk and because of the manifested potential of cysteamine for developmental toxicity in suckling rat pups when it was administered to their lactating mothers at an oral dose of 375 mg/kg/day (2,250 mg/m2/day, 1.7 times the recommended human dose based on body surface area), a decision should be made whether to discontinue nursing or to discontinue the drug, taking into account the importance of the drug to the mother. The safety and effectiveness of CYSTAGON® for cystinotic children have been established. Cysteamine therapy should be initiated as soon as the diagnosis of nephropathic cystinosis has been confirmed. In three clinical trials, cysteamine or phosphocysteamine have been administered to 246 children with cystinosis. Causality of side effects is sometimes difficult to determine because adverse effects may result from the underlying disease. The most frequent adverse reactions seen involve the gastrointestinal and central nervous systems. These are especially prominent at the initiation of cysteamine therapy. Temporarily suspending treatment, then gradual re-introduction may be effective in improving tolerance. Adverse reactions were not collected systematically in the NCCS, but were often listed by investigators. The following rates may therefore be underestimated. The most common events (> 5%) were vomiting 35%, anorexia 31%, fever 22%, diarrhea 16%, lethargy 11%, and rash 7%. Body as a whole: Dehydration. Digestive: Nausea, bad breath, abdominal pain, dyspepsia, constipation, gastroenteritis, duodenitis, gastrointestinal ulceration and bleeding. Central Nervous System: Somnolence, encephalopathy, headache, seizures, ataxia, confusion, tremor, hyperkinesia, decreasing hearing, dizziness, jitteriness. Psychiatric: Nervousness, abnormal thinking, depression, emotional lability, hallucinations, nightmares. Urogenital: Interstitial nephritis, renal failure (see WARNINGS). Clinical Laboratory: Abnormal liver function, anemia, leukopenia. Adverse reactions or intolerance leading to cessation of treatment occurred in 8% of patients in the U.S. Studies. Withdrawals due to intolerance, vomiting associated with medication, anorexia, lethargy, and fever appeared dose related, occurring more frequently in those patients receiving 1.95 grams/m2/day as compared to 1.30 grams/m2/day. Sudden deaths have been reported in this disease state. Benign intracranial hypertension (or pseudotumor cerebri; PTC) with papilledema; skin lesions, molluscoid pseudotumors, skin striae, skin fragility; joint hyperextension, leg pain, genu valgum, osteopenia, compression fracture and scoliosis have been reported (see PRECAUTIONS). CYSTAGON® has not been associated with abuse potential, psychological or physical dependence in humans. A single oral dose of cysteamine at 660 mg/kg was lethal to rats. Symptoms of acute toxicity were reduction of motor activity and generalized hemorrhage in gastrointestinal tract and kidneys. Two cases of human overdosage have been reported. In one case, the patient immediately vomited the drug and did not develop any symptoms. The second incident involved an accidental ingestion of a 200 to 250 mg/kg dose by a healthy 13 month old child. Vomiting and dehydration were experienced. The child was hospitalized and fluids were administered. A full recovery was made. Should overdose occur, the respiratory and cardiovascular systems should be supported appropriately. No specific antidote is known. Hemodialysis may be considered since cysteamine is poorly bound to plasma proteins. For the management of nephropathic cystinosis, cysteamine therapy should be initiated promptly once the diagnosis is confirmed (i.e., increased white cell cystine). New patients should be started on ¼ to 1/6 of the maintenance dose of CYSTAGON®. The dose should then be raised gradually over four to six weeks to avoid intolerance. The recommended CYSTAGON® maintenance dose for children up to age 12 years is 1.30 grams/m2/day of the free base, given in four divided doses. Intact CYSTAGON® capsules should not be administered to children under the age of approximately six years due to the risk of aspiration. CYSTAGON® capsules may be administered to children under the age of approximately six years by sprinkling the capsule contents over food. Patients over age 12 and over 110 pounds weight should receive 2.0 grams/day, divided four times daily. If a dose is missed, it should be taken as soon as possible. If it is within two hours of the next dose, skip the missed dose and go back to the regular dosing schedule. Do not double dose. When CYSTAGON® is well tolerated, the goal of therapy is to keep leukocyte cystine levels below 1 nmol/½ cystine/mg protein five to six hours following administration of CYSTAGON®. Patients with poorer tolerability still receive significant benefit if white cell cystine levels are below 2 nmol/½ cystine/mg protein. The CYSTAGON® dose can be increased to a maximum of 1.95 grams/m2/day to achieve this level. The dose of 1.95 grams/m2/day has been associated with an increased rate of withdrawal from treatment due to intolerance and an increased incidence of adverse events. Cystinotic patients taking cysteamine hydrochloride or phosphocysteamine solutions may be transferred to equimolar doses of CYSTAGON® capsules. The recommended maintenance dose of 1.30 grams/m2/day can be approximated by administering CYSTAGON® according to the following table, which takes surface area as well as weight into consideration. Patients over age 12 and over 110 pounds should receive 2.0 grams/day given in four divided doses as a starting maintenance dose. This dose should be reached after 4 to 6 weeks of incremental dosage increases as stated above. The dose should be raised if the leukocyte cystine level remains > 2 nmol/½ cystine/mg/protein. Leukocyte cystine measurements, taken 5 to 6 hours after dose administration, are recommended for new patients after the maintenance dose is achieved. Patients being transferred from cysteamine hydrochloride or phosphocysteamine solutions to capsules should have their white cell cystine levels measured in 2 weeks, and thereafter every 3 months to assess optimal dosage as described above. If CYSTAGON® is poorly tolerated initially due to gastrointestinal tract symptoms or transient skin rashes, therapy should be temporarily stopped, then re-instituted at a lower dose and gradually increased to the proper dose. PHARMACIST: Detach Patient Information Leaflet at each perforation and give leaflet to patient. The following information is available for patients and/or guardians in the patient leaflet. Read the Patient Information that comes with CYSTAGON® before you or your child starts taking it and each time you get a refill. There may be new information. This leaflet does not take the place of talking with your doctor about your or your child’s medical condition or treatment. CYSTAGON® is a medicine used to manage a medical condition called nephropathic cystinosis, in children and adults. Nephropathic cystinosis is a rare inherited condition which causes the build up of a protein building block called cystine in the kidneys. The build up of cystine causes kidney problems. These kidney problems cause the body to lose too much sugar (glucose), proteins, and electrolytes. Cystinosis may lead to slow body growth, weak bones and worsening kidney failure. Who should not take CYSTAGON®? Do not take CYSTAGON® if you or your child is allergic to any of the ingredients in it, other products containing cysteamine, or penicillamine. See the end of this leaflet for a complete list of ingredients in CYSTAGON®. What should I tell my or my child’s doctor before taking CYSTAGON®? have had an allergic reaction to a medicine containing cysteamine in the past. are pregnant or plan to become pregnant. It is not known whether CYSTAGON ® may harm your unborn baby. Do not take CYSTAGON ® during pregnancy unless you and your doctor decide that the possible benefit of taking CYSTAGON ® is more important than the risk to an unborn baby. It is not known if CYSTAGON ® will pass into breast milk. You and your doctor should decide whether to stop nursing or to stop taking the medicine. Know the medicines you or your child takes. Keep a list of your or your child’s medicines and show it to your or your child’s doctor and pharmacist when you get a new medicine. How should CYSTAGON® be taken ? Take CYSTAGON® exactly as prescribed. Do not increase or decrease the amount of medicine without your doctor’s approval. If you or your child takes too much CYSTAGON ®, call your doctor or Poison Control Center, or go to the nearest hospital emergency room right away. Do not give CYSTAGON ® capsules to children under six years of age. They may not be able to swallow them and may choke. For children under six years of age, the capsule may be opened and the contents sprinkled on food. Talk to your doctor for complete directions. Your doctor will arrange for regular blood tests to be done to measure the amount of cystine inside white blood cells. This will help to determine the correct dose of CYSTAGON ®. Regular blood and urine tests will also be done to measure the levels of the body’s important electrolytes. This will help your doctor to correctly adjust the doses of these supplements. What should I or my child avoid while taking CYSTAGON®? CYSTAGON® may cause some people to become sleepy or less alert than they are normally. You or your child should not drive, operate machinery, or do other dangerous activities until you know how CYSTAGON® affects you. What are the possible side effects of CYSTAGON®? Skin rash. Tell your doctor right away if you or your child gets a skin rash. CYSTAGON ® may need to be temporarily stopped until the rash goes away. If the rash is severe, your doctor may totally stop the CYSTAGON ®. Central nervous system symptoms: Some patients taking cysteamine have developed seizures, depression, and become too sleepy (excessive sleepiness). Tell your doctor if you or your child has these symptoms. Stomach and intestinal (gastrointestinal) problems: Patients taking cysteamine have developed ulcers and bleeding. Tell your doctor right away if you or your child get stomach pain, nausea, vomiting, loss of appetite, or throw up blood. Benign intracranial hypertension, also called pseudotumor cerebri, has been reported. This is a condition where there is high pressure in the fluid around the brain. Tell your doctor right away if you or your child develop any of the following symptoms while taking CYSTAGON ®: headache, buzzing or “whooshing” sound in the ear, dizziness, nausea, double vision, blurry vision, loss of vision, pain behind the eye or pain with eye movement. Your doctor will monitor you or your child with eye examinations to find and treat this problem early. This will help lessen the chance of loss of eyesight. Skin lesions, bone lesions, and joint problems. Children treated with high doses of cysteamine may develop skin lesions. These include skin striae (which are like stretch marks), bone injuries (such as fractures), bone deformities, and joint problems. Examine your or your child’s skin while taking CYSTAGON ®. Report any changes to your doctor. Your doctor will monitor you or your child for these problems. How should I store CYSTAGON®? Store CYSTAGON ® in a dry place away from light. Store CYSTAGON ® between 68° to 77°F (20° to 25°C). Keep CYSTAGON® and all medicines out of the reach of children. Medicines are sometimes prescribed for conditions that are not mentioned in the patient leaflet. Do not use CYSTAGON® for a condition for which it was not prescribed. Do not give CYSTAGON® to other people, even if they have the same symptoms that you or your child have. It may harm them. This patient information summarizes the most important information about CYSTAGON®. If you would like more information about CYSTAGON®, talk with your doctor. You can ask your doctor or pharmacist for information about CYSTAGON® that is written for health professionals. For more information call 1-877-446-3679. What are the ingredients in CYSTAGON®? Active ingredient: cysteamine free base as cysteamine bitartrate. Inactive ingredients: ammonium hydroxide, black iron oxide, colloidal silicon dioxide, croscarmellose sodium, gelatin, magnesium stearate, microcrystalline cellulose, pharmaceutical glaze, pregelatinized starch, propylene glycol, sodium lauryl sulfate and titanium dioxide. and Parent Information Leaflet to each patient. to 50 mg of cysteamine. to 150 mg of cysteamine.